Speaker of the House John Boehner embraces heartland values and is a stalwart defender of the American Dream. But he faces an administration seemingly bent on derailing his goal of preserving prosperity for future generations. 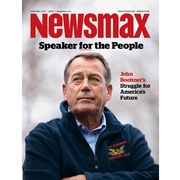 The January issue of Newsmax magazine profiles the trials and triumphs of the Speaker for the People.